RIO DE JANEIRO, BRAZIL – The Prefeitura (City Hall) of Rio de Janeiro will remove 78 bus lines within the city’s Zona Sul (South Zone) by 2016 in an effort to streamline public transportation and ease the flow of traffic. The beginning of a reduction in bus traffic by 35 percent this year has been postponed from July to October amid protests by residents. The bus fleet will be reduced by 700 vehicles improving the city’s traffic, photo by Eduardo P/Wikimedia Creative Commons License. Of the total of 78 bus lines, which should be removed or merged with other lines, 33 lines will already cease to exist this year in Zona Sul in a gradual effort from October to December. Additionally, 21 lines will be shortened, while five new lines should make up for lost connections. Eleven of the lines that will be removed are connections to the Zona Norte (North Zone). With fewer lines, around 700 vehicles will be eliminated from today’s fleet of 2,000 buses. In Nossa Senhora de Copacabana, one of the city’s busiest streets, the amount of buses should be reduced from 300 per hour to 120 per hour. 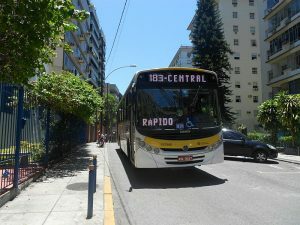 The reduction has been approved by experts, who see traffic to be improved in the congested Zona Sul, but bus drivers and fee collectors fear for their jobs, while passengers disapprove of having to take several buses when traveling from the North to the South or from Barra da Tijuca to Centro when taking the route through Zona Sul. “Most passengers will not even have to change [buses]. In the South Zone, the buses should run with eighty percent of their capacity during peak hours, and with no less than fifty percent [during other times]. I do not believe we will have unemployment,” Subsecretary of Transport, Alexandre Sansão, reassured passengers in O Globo. Sansão added that the remaining bus lines will be able to run faster and therefore shorten travel time. The reduction measure is believed to streamline public transportation and increase the system’s efficiency overall. The reduction of all 78 lines is planned to be completed before the start of the 2016 Olympic Games. For a full list of the bus lines that will be removed or shortened this year, see here.